Former UGA Skidaway Institute executive director Jim Sanders retired last summer. Sanders led the institution from 2001 until 2016, when he stepped back from his executive directorship, but remained active in a faculty post. During his 15 years as director or executive director, Sanders guided Skidaway Institute through two recessions and the 2013 merger with the University of Georgia. Sanders earned his bachelor’s degree in zoology from Duke University and followed it up with a master’s degree and doctorate in marine sciences from the University of North Carolina – Chapel Hill. His first exposure to Skidaway Institute came as a graduate student with Herb Windom in the 1970s. 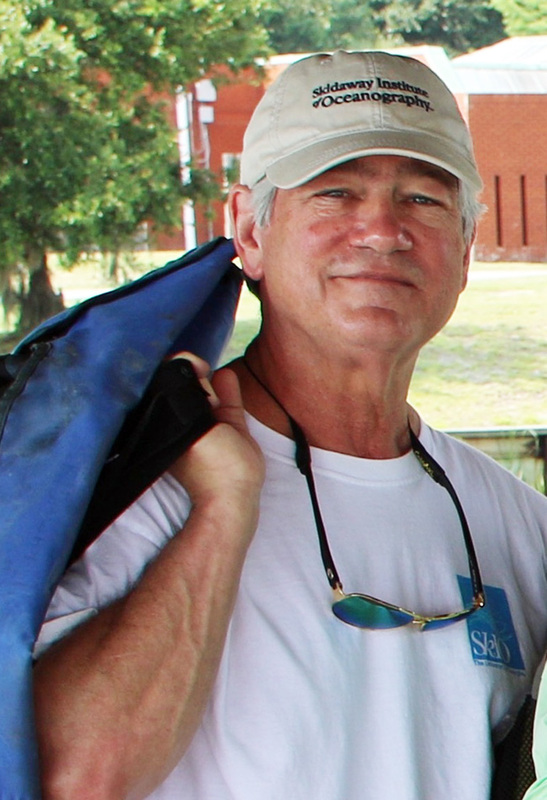 Prior to his arrival in Savannah in 2001, Sanders was on the faculty and served as director of the Academy of Natural Sciences’ Estuarine Research Center in Maryland. He then was chairman of the Department of Ocean, Earth and Atmospheric Sciences at Old Dominion University in Virginia. Sanders is known for his interests within the area of nutrient and trace element biogeochemistry, especially how trace elements are transported through coastal zones, transformed by chemical and biological reactions during transport, and how they influence growth and species composition of autotrophic organisms. Sanders has been very active as a consultant to federal and state science agencies, and industrial groups in the U.S. and Europe. He is a member of numerous scientific societies, was president of the National Association of Marine Laboratories, and was a trustee and officer of the Consortium for Ocean Leadership. He is the author of over 75 scientific publications. Shortly after taking the helm at Skidaway Institute, the nation was hit with an economic downturn sparked by the 9/11 terrorist attacks, and maintaining adequate funding for research and operations was a challenge. “The most effective way to deal with it was to hire innovative and interdisciplinary faculty members who would come up with important research questions and then find funding to pursue those avenues,” Sanders said. Looking back, Sanders said he has always been amazed at the extent to which Skidaway Institute fosters an interactive, collegial work experience. 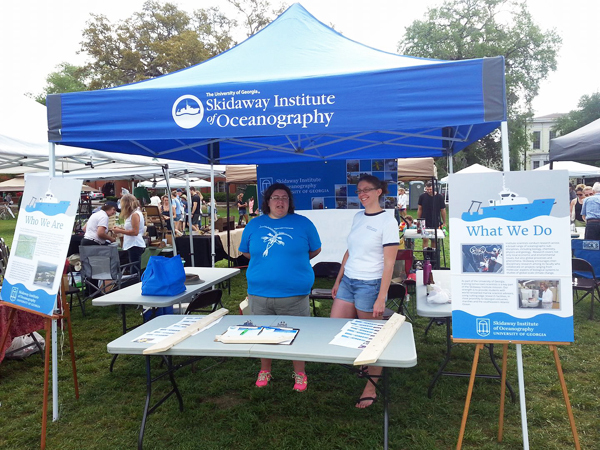 “I have been at a number of other institutions, large and small, many with a similar focus on oceanography, but I have never felt the interconnections that Skidaway has offered, both to me and other staff, over the past 42 years,” Sanders said. As Sanders looks back over his time at Skidaway, he is most proud for what he, the faculty and staff have done together. Sanders remains at the institute as a professor emeritus. More than 300 people turned out for the second annual Oyster Roast for Reason to benefit UGA Marine Extension and Georgia Sea Grant. 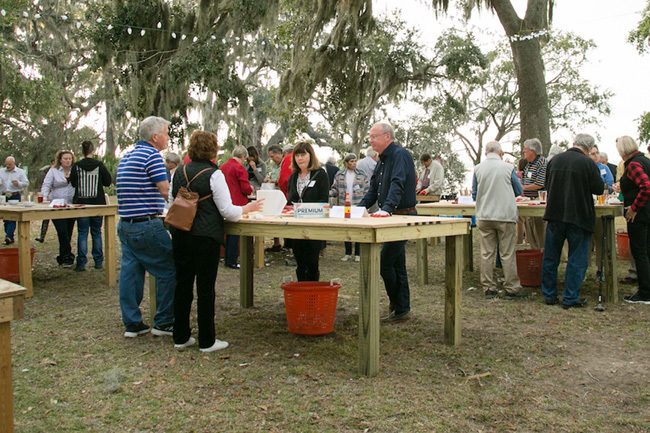 Guests feasted on roasted wild oysters and sampled raw, single oysters on the half shell provided by Savannah Clam Co. that originated at the UGA Oyster Hatchery on Skidaway Island in Savannah. Sponsors of the event came from as far as Atlanta. Guests received commemorative oyster shuckers and pint glasses. Many watched Georgia defeat Auburn in the SEC championship game, shown on a big screen television set up on the bluff behind the UGA Marine Education Center and Aquarium. Music was provided by American Hologram, a Savannah favorite. The event is designed to raise awareness of the hatchery, which has been growing oysters from larvae since 2015. When the spat (baby oysters) grow to roughly the size of a pencil eraser they are given to shellfish farmers on the Georgia coast, who cultivate them to maturity. Money raised by the roast supports the hatchery. “Our plan is to purchase additional larval tanks, water storage tanks and other equipment that will allow us to increase production in the hatchery,” said Tom Bliss, director of the Shellfish Research Lab, a part of UGA Marine Extension and Georgia Sea Grant. In 2017, the hatchery produced between 1,500,000 and 2,100,000 spat, exceeding the needs of the developing industry. Just over 500,000 spat were planted by shellfish growers, with a potential harvest value of $125,000 to $250,000. Interest in farming oysters continues to rise as changes in regulation are anticipated to occur. 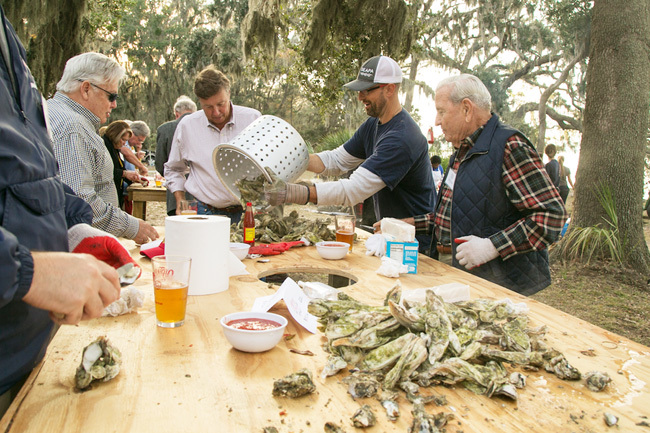 Proceeds from Oyster Roast for a Reason will help the Shellfish Lab move closer to the goal to produce 15 million spat, with harvest valued between $3 million and $7.5 million. Some of the money raised also will support a 12-week internship for a college student, who will work in the hatchery and on research projects focused on testing new equipment and methods to make oyster farming easier for growers. The University of Georgia’s third annual Youth Ocean Conservation Summit took place earlier this year at UGA Marine Extension and Georgia Sea Grant on Skidaway Island. 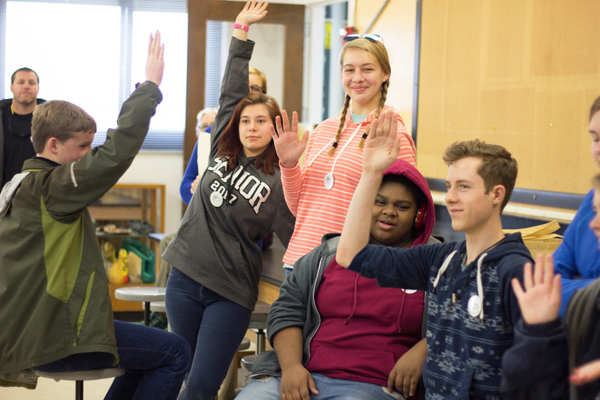 Thirty students between the ages of 12 and 17 heard from engaging keynote speakers, participated in skill-building workshops and created their own initiatives to tackle current conservation issues. 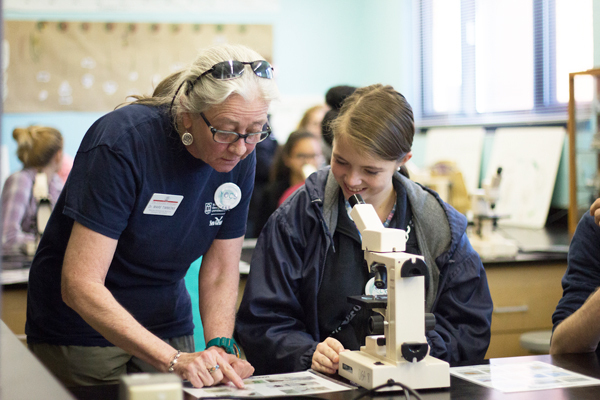 Marine Extension educator Mare Timmons works with a summit student. This event had been many months in the making, organized by me and the three other Georgia Sea Grant interns at the Marine Education Center and Aquarium. I can’t say I was surprised by the vast number of logistics that had to be tackled in order to pull off this event. However, several things did catch me off-guard. First and foremost was the task of creating a project that would challenge the students to think critically and enthusiastically about conservation issues that were important to them. In turn, making a worksheet with guided questions challenged us to think about the important components of creating a conservation initiative. There was a good deal of mentally stimulating work to be done, which was a facet of the project that I greatly appreciated. Challenging ourselves to create a thorough program led to a successful event in which students not only learned how to make change, but also took the first steps towards doing so. Their projects addressed issues such as marine debris, deforestation and coral bleaching caused by sunscreen. It was extremely rewarding to see the students tackle what we had prepared for them with such enthusiasm. Participants respond to a discussion. A welcome surprise was the overwhelming amount of support we received as we were planning the event. Marine Extension and Georgia Sea Grant employees, both from Skidaway Island and from Brunswick, were invested in our project and happy to help. They did everything from advertising to presenting on the day of the workshop. Their help was essential to the successful implementation of the summit, and I couldn’t be more grateful to have such dedicated people supporting us. We also received outside support in the form of donations from Stream2Sea, the Tybee Island Marine Science Center and Gray’s Reef National Marine Sanctuary. The donations were given to participants, not only as goodies, but as a way to familiarize and connect them with these other outstanding organizations. The scientific community in Georgia is a close-knit network of people who support one another to advance change and make positive impacts. I’m pleased that we were able to introduce the summit participants to this community. All of our planning and preparation culminated in a successful summit, ripe with creativity, dedication and inspiration. Keynote speakers included Clayton Ferrara, the executive director of IDEAS For Us, and Olivia and Carter Ries , the founders of One More Generation. Our colleagues, along with speakers from One Hundred Miles, Leadership Savannah and Savannah State University led science workshops and skill-building activities. The day ended on a spectacular note, with groups of students presenting well-developed and creative plans to undertake conservation initiatives of their own design. I speak for all of the Georgia Sea Grant marine education interns when I say that we couldn’t have hoped for a better event. Everyone that participated in this summit was inspiring, and the involvement of so many young people was a testament to the fact that anyone, at any age, can make a difference. 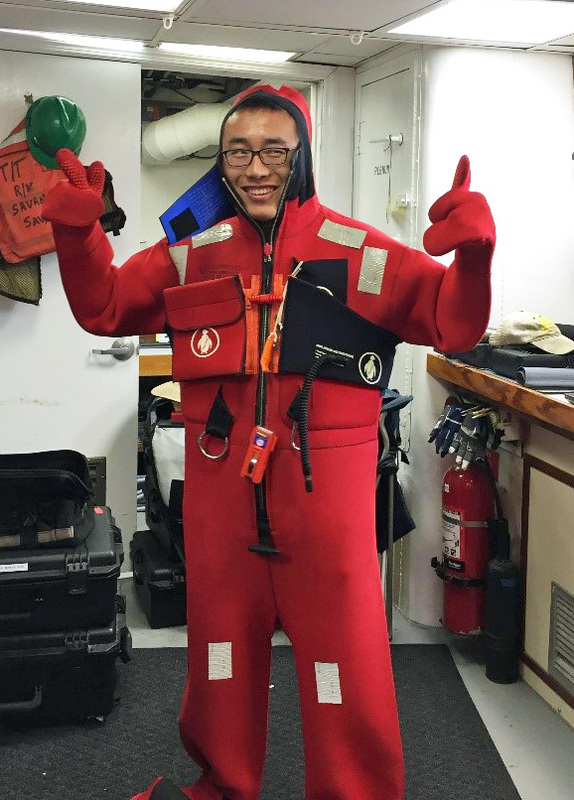 Skidaway Institute graduate students Kun Ma and Lixin Zhu recently joined a science cruise on the Research Vessel Savannah off Cape Hatteras, North Carolina. The cruise, which ran from May 31-June 5, was led by Jeffrey Book from the U.S. Naval Research Laboratory. The main objective of this cruise was to test and demonstrate the use of gliders together in teams and to assimilate the data into ocean forecast models. The cruise was 22 days in total, divided into three legs. Ma and Zhu were part of the third leg. Kun Ma cocking the Niskin bottles on a Conductivity-Temperature-Depth array. Ma is a new University of Georgia doctoral student at Skidway, working mainly on a National Science Foundation-funded photochemistry project with professors Jay Brandes and Aron Stubbins. This was her first science cruise and she collected some particulate organic matter and dissolved inorganic carbon samples. She also helped Skidaway Institute researcher Bill Savidge by collecting some chlorophyll samples in order to calibrate the chlorophyll sensor on the CTD instrument, an instrument used to collect water samples and measure those samples’ properties, such as Conductivity (a proxy for salinity), Temperature and Depth. Zhu is a visiting doctoral student in Aron Stubbins’s lab from East China Normal University. He collected filtered water samples on the cruise. 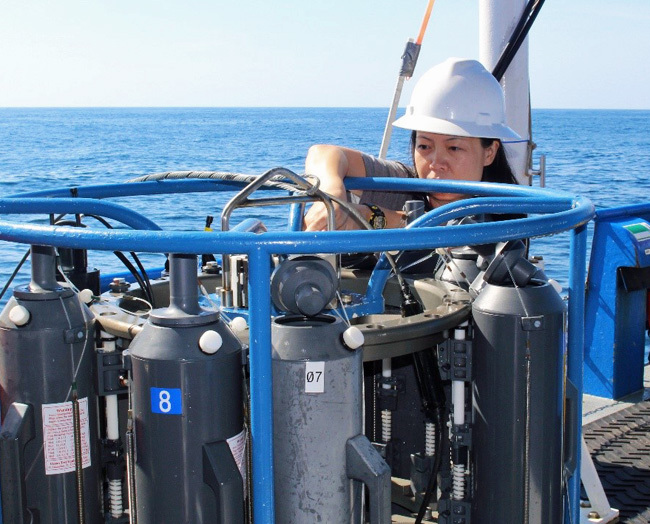 Zhu will analyze the color and fluorescence of dissolved organic matter, and dissolved black carbon concentrations. In addition, Zhu performed solid phase extraction and collected high-resolution real-time data on colored organic matter with the underway scientific computer system on the ship. Eventually, he will combine these data with other field data collected in the South Atlantic Bight area to see the overall dynamics of dissolved black carbon. UGA Skidaway Institute scientists Elizabeth Harvey (l) and Sasha Wagner ready to greet visitors at Earth Day celebration. A team from Skidaway Institute participated in Savannah’s Earth Day celebration in Forsyth Park on Saturday, April 15. Manning an information booth, the group interacted with hundreds of visitors at the event and passed out copies of Skidaway Campus Notes newsletters and Skidaway Institute stickers. The participants included Elizabeth Harvey, Sasha Wagner, Lee Ann Deleo, Aron Stubbins, Thais Bittar, Dana Savidge, Julia Diaz, Christina Codden and Mike Sullivan. Gray’s Reef National Marine Sanctuary, in collaboration with Georgia Public Broadcasting, created a livestream virtual dive event on May 10 from the UGA Marine Education Center and Aquarium. More than 35,000 viewers from as far away as Romania tuned in from their homes, schools and offices to dive into a 30-minute virtual field trip of Gray’s Reef, located approximately 20 miles off the coast of Georgia’s Sapelo Island. The virtual expedition included underwater surgery on a fish to insert a tagging transmitter and beautiful views of the vibrant and abundant marine life found at Gray’s Reef. Viewers learned how Gray’s Reef was formed, how the seafloor serves as a habitat and how they can help protect the reef from threats. 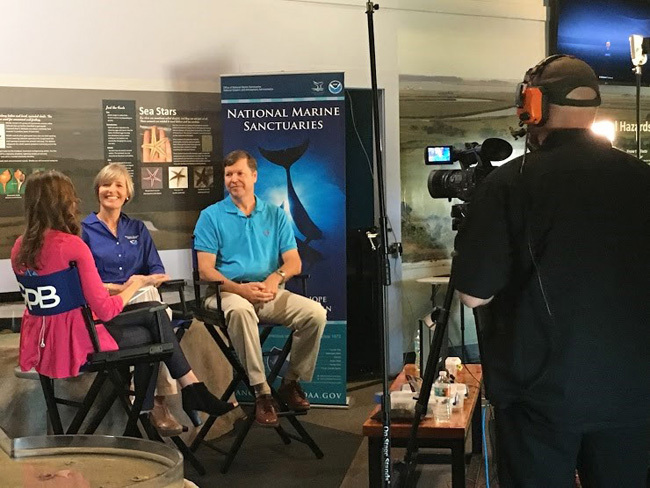 The sanctuary’s communications coordinator, Michelle Riley, worked with GPB’s Education division in Atlanta to create the event using underwater footage of Gray’s Reef and featuring sanctuary superintendent Sarah Fangman and UGA researcher Scott Noakes as experts. Emily Woodward and her colleagues at UGA Marine Extension and Georgia Sea Grant provided substantial support to the event, and aquarium staff updated the tanks with a colorful new interpretation of Gray’s Reef. UGA’s Skidaway Institute of Oceanography provided technical assistance, utilizing the expertise of senior system administrator Wayne Aaron. Targeted to students, the livestream included a question-and-answer session with Fangman and Noakes, during which viewers submitted more than 1,000 questions. The event was accompanied by supplemental materials tailored to Georgia Department of Education standards for K-12. GPB had hoped for an audience of 3,000 – 5,000, and was pleased that the participation level was substantially higher than originally expected. To view the archived event, go to http://www.gpb.org/education/explore/grays-reef. The organizers of the 2017 Skidaway Island Marathon recently presented a donation of $600 to the Associates of Skidaway Institute. Endurance Race Services organized the March 25 race, which had both its start and finish lines on the UGA Skidaway Marine Science Campus. The marathon organizers support a number of area nonprofits with the race proceeds. This was the third year the Skidaway Island Marathon was based out of the Skidaway campus. 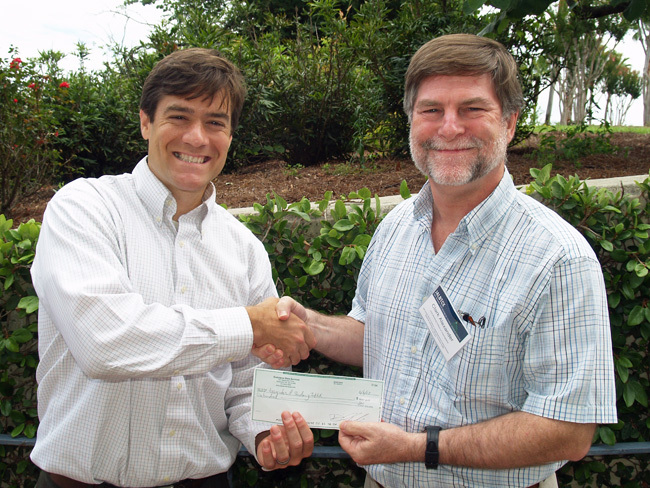 Dan Pavlin (l) from Endurance Race Services presents a check to Skidaway Institute interim executive director Clark Alexander.